Argyle’s life was exactly the way he wanted it. He was the same as all the other sheep and that was just fine with him. While roaming the highlands, Argyle discovered some especially tasty grass and some very colorful flowers. Day after day he ate the flowers until… “One day MacDougal’s wife, Katharine, said, “Why dinna ye tell me about the many-colored sheep, MacDougal?” The ensuing fuss is not at all to Argyle’s liking. Placed in a pen by himself, he can’t roam and he can’t eat the delicious, colorful flowers. Thankfully, it does not take long in the “special” pen for him to lose his many colors. He returns to looking and feeling like a sheep and that is just fine with him. 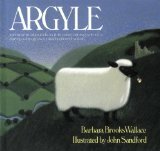 Argyle is a lovely, gentle folk tale that reminds us being different may not be all that it seems. Sometimes being the same as everyone else is just fine. Katie Morag & the Dancing Class is a new and delightful picture book from Mairi Hedderwick. Also set in Scotland, it has been decided that the Isle of Struay children will benefit from dancing classes. Despite the efforts of her two grandmas, Katie Morag has more interesting things to do than learn ballet. Much to Granma Mainland’s dismay, Katie prefers wellies to ballet slippers and never manages to arrive at her ballet class on time. One Saturday morning, Katie misses the entire class, arriving just as The Big Boy Cousins begin their tap dance class. As those who know Katie might suspect, she is more inclined toward tap dancing than ballet and before long Grannie Island is rummaging in her cupboards for metal tacks. Katie Morag has long been a favourite in our household. We first me her in Katie Morag Delivers the Mail and have enjoyed her many adventures and misadventures very much. There is a gentleness to the stories and a wonderful sense of community. In this book, the contrast between the two grandmas (Granma Mainland and Grannie Island) is highlighted. Of course, both want what is best for Katie but it is Grannie Island who understands her best. For further ideas about celebrating diversity, be sure to visit our Celebrating Diversity with Picture Books page and our page with Quotes about Diversity. If you are pulling together resources about sheep and lambs, you may be interested in our Baa Baa Black Sheep nursery rhyme printable. A free printable nursery rhyme for home and school use. My thoughts about Cat’s Night Out”… It’s Saturday night and, as Easy Street grows dark, it is time for the neighborhood felines to kick up their heels. Featuring evocative illustrations that include hidden numbers, this rhyming counting book also includes a wide variety of dance steps, costumes and vocabulary. Highly recommended.